You can quickly perform tasks on multiple worksheets at the same time by grouping worksheets together. If you group a set of worksheets, any changes you make on one worksheet are made in all the other worksheets in the group in the exact same location on the worksheets. If you want to create, for example, standard tables or calculations on a large number of worksheets, grouping can save you a lot of time. This works best if the worksheets already have identical data structures. 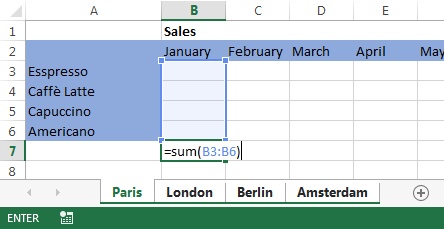 In the example below, a workbook has multiple worksheets for different cities. All the worksheets have identical structures showing sales of coffee drinks. To perform the same tasks for a particular set of worksheets, follow the steps below. 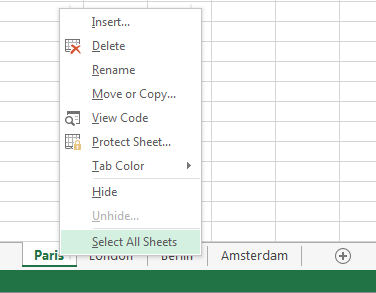 Press and hold down the Ctrl key, and click the worksheet tabs you want to group. Tip: If you want to group consecutive worksheets, click the first worksheet tab in the range, press and hold the Shift key, and click the last worksheet tab in the range. Note: When you group worksheets, the name of the workbook changes to include [Group]. Press and hold the Ctrl key, and click the worksheet tabs you want to ungroup. You can easily group all the worksheets in a workbook. Note: When you group all worksheets, browsing through the worksheets ungroups them. 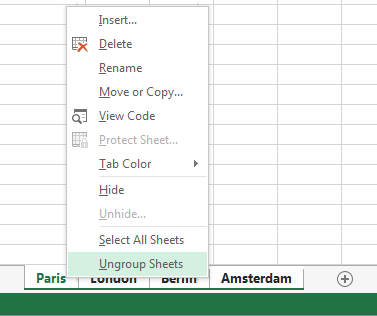 You can browse through the grouped worksheets without ungrouping them if you don’t select all worksheets. When you’ve made all the changes, you can ungroup the worksheets. 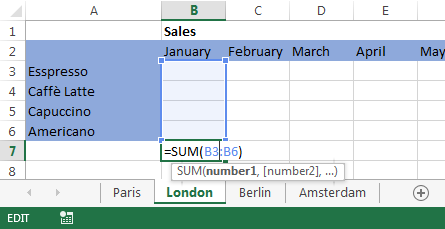 Right-click any worksheet tab in the group. Tip: To ungroup all worksheets, you can also click any worksheet tab outside the group.